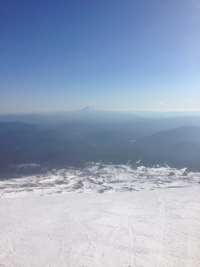 We had a great opportunity to do some climbing and skiing on Mount Hood this week followed by some bouldering on the way home at Boulder Mountain. The weather has been awesome in Portland and my friends John and Courtney were visiting. We decided to skip heading down to the American Alpine Clubs Cragging Classic at Smith Rocks where some other friends have been hanging out for the week and opted to make some early season turns on Hood by climbing up the snowpack at Timberline and skiing back down. The day was amazing. We were out pretty late Sunday night so we didn’t get to Hoods base until 2 in the afternoon. We slapped on our skins and ran up the snowpack to follow the Palmer Glacier. 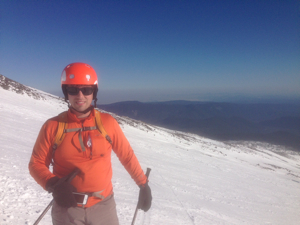 We skinned up the glacier pretty quick and got to the base of Hoods’ summit cone, near the end of the ski lifts. Apparently the lifts were running Saturday and we could have done some in-bound skiing if we came over the weekend but the climb up the snowpack was amazing anyway. 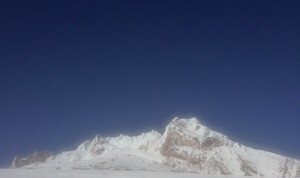 We had really warm weather and virtually no wind on a blue-bird day. We really could not have asked for better weather. Looking back down the glacier we got amazing views of Mount Jefferson and some of Broken top and the other volcanoes down near Bend. We passed a group of skiers that had already come down and a guy from Kansas City who tried to summit but turned back a short way from Hoods summit due to a late day start and almost passing out from the funerals. I can’t stress enough that climbing Hood requires a very early start before you get dangerous rockfall due to snow melting and boulders falling down. We had no intentions of going that high and no business doing so this late in the day. I was impressed at how pungent the funerals were today just from where we were. The guy from Kansas City made it safely back to his Vanagon, and we started down on our skies. The run down was perfect with great spring corn snow. Every turn was soft and it was great to make the first turns of the year. John ready to ski down. After we got down to the car we had a quick beer at the Timberline Lodge, the iconic hotel that was the set for the Stephen King movie The Shinning. 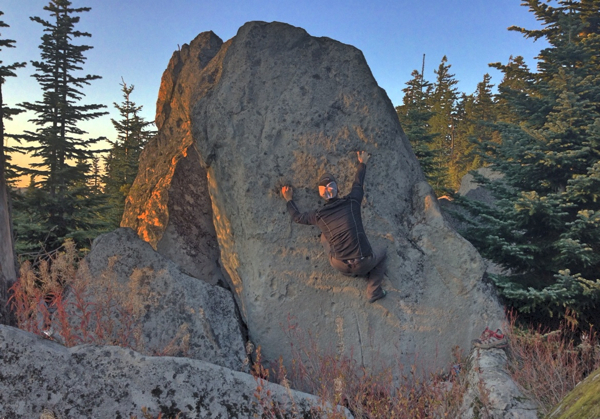 On the way back to Portland we decided to stop and do a few boulder problems on Boulder Mountain just before sunset. We passed through the Lost City bouldering area first and checked out some of the classics but we were loosing light in the trees so we drove out to the Meadow Area instead to get on some fun problems. The Meadow is a part of Boulder Mountain that has large boulders sitting in a nice field with some great landings. It ended up being a great spot for late day bouldering. 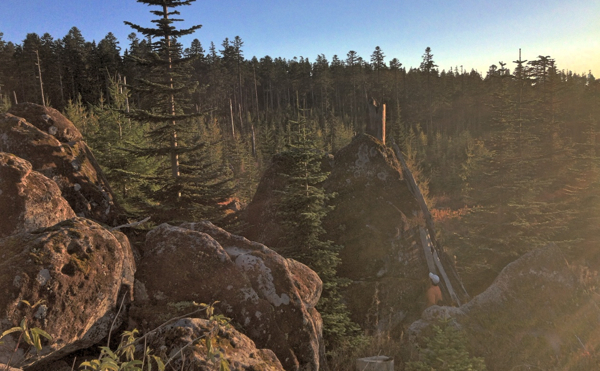 The area has some really nice fins of rock and a very big 20 foot high boulder sitting at the edge of the woods. We did a few problems on the smaller boulders and ended up putting up 4 new problems at this cluster. There is a really nice V7ish problem that comes out of a roof/cave that I want to get back to do while there is still good temps/weather. The setting just above the Gorge is beautiful and really reminds me of parts of Colorado where boulders just lie strew across fields with great landings and high quality problems. 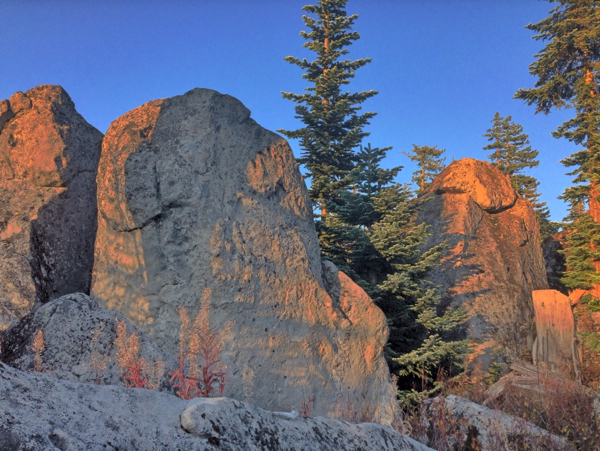 The rock is a little like Leavenworth meets Portland: soft rock that feels like granite but is nice pocketed volcanic. I hope to get out again soon while this amazing weather holds up.